True Detective Deepens the Mystery in "Kiss Tomorrow Goodbye"
Indulge me for a second, would you? I might dwell on title sequences more than is strictly necessary, but honestly, I think they’re an underappreciated art form and that good ones don’t get the credit they’re due, just as terrible ones are under-examined in their ability to undermine credibility and make audiences impatient. True Detective has an excellent one, with brooding, symbolically freighted images that perfectly underline the mood of the series, cloudscapes dissolving into neocorices, full moons reflecting unblinking eyes. Not to mention the smoldering T-Bone Burnett score. Bravo. Amelia (Carmen Ejogo) unofficially begins to assist the investigation by asking her students about the creepy dolls. One kid says they were being passed out at Halloween. Hays comes to a bar where she’s having a drink with friends, and they do a kind of voluntary self-deposition. She’s local, dropped out of college and went to San Francisco, got mixed up with the Panthers, came home and finished her degree; he’s descended from ag workers and was told he was “dumb” as a kid because he was dyslexic. She’s a vegetarian. (“If you’re a Democrat, don’t tell me,” he replies.) They bond over not wanting to get married and other “crazy” ideations. The candor is positive, it feels good. Then the bar TV starts broadcasting a press conference about the Purcell case. Hays appreciates the prosecutor’s honesty considerably less, as it predictably starts a mass panic and a glut of phony leads. In 2015, Hays continues his interview with the documentarian, who asks about 1990, after what happened “with Julie and her father” and after Hays left the police. He’s looking back over Amelia’s book, and mentions to Henry’s wife that he never actually read the whole thing because he was uncomfortable with how much of it is about him. Then, suddenly, he seems to come to, in his bathrobe, standing at the corner of the Purcells’ street. He looks terrified. This episode deepens the mystery laid out in the first, bringing up several missing pieces: We now know one of the missing children was not murdered. We know something happened between Hays and his partner, that something happened between him and his daughter, and that something might have happened between him and his son. We know something makes him quit the police force in 1990. We know he never read his wife’s book about the case. We know there are a handful of suspects who will probably be found innocent of involvement. In the development of dementia, there is sometimes a silver lining, in that losing your memory can release you from memories you wish you didn’t have. It can occasion a sort of beneficent calm as the person loses track of old resentments and grudges. That tranquility comes at a huge price, but for some people it’s part of the story. Wayne Hays isn’t there yet. He still remembers too much. 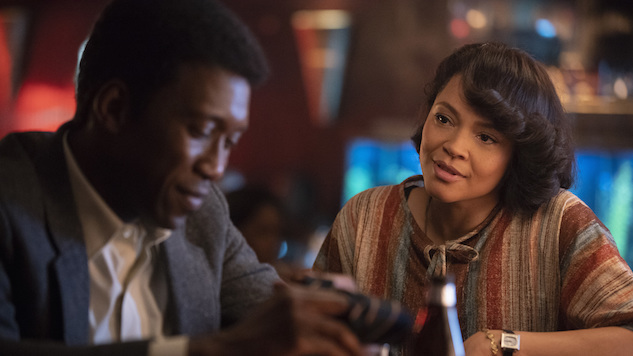 Read Paste’s review of True Detective’s Season Three premiere here.